One thing you can say about the railroad industry: they sure come up with some interesting names for their trains! “Coast Starlight” conjures up accurate images of that train: it traverses the length of California’s west coast, partly at night. “Sunset Limited”? Well, it runs from Los Angeles to Orlando, and it does take three days, so I guess you see a bunch of sunsets. “Silver Meteor” (Tampa to New York) I presume is simply meant to conjure up images of a silver train streaking by like a meteor. Although these trains also have numbers (the Silver Meteor is #98 northbound, #97 southbound), giving them names conjures up romantic images that you certainly don’t get from a mere number. Having now spent a bunch of time on three separate trains (so far; two to go), I wanted to take an opportunity to try and paint a picture of what life is like on an Amtrak train. Long-distance train travel is an experience like no other. Booking your tickets is comparable to booking an airline flight. 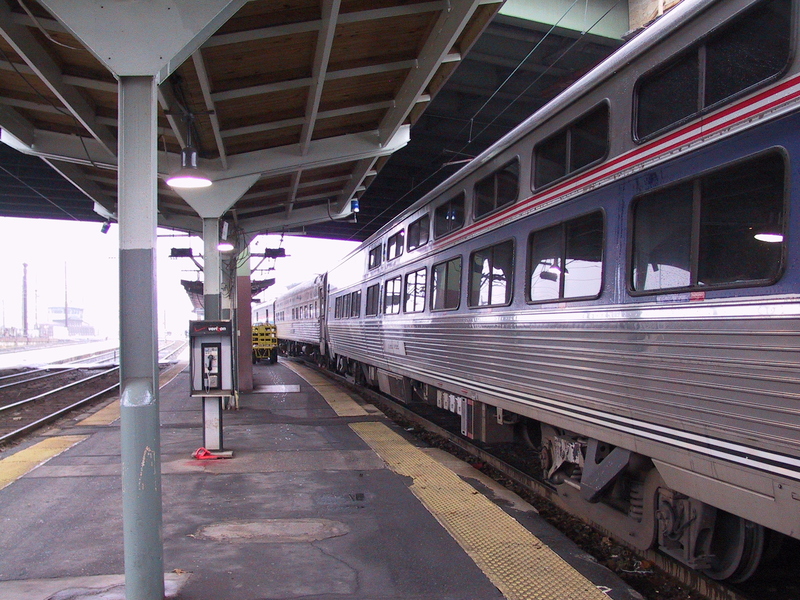 You can arrange your trip through a travel agent, through an Amtrak ticket agent, or on the Web. Their website is pretty good, although they aren’t quite up to the “print your own ticket” level. Once you have purchased your tickets online, you can choose to have them mailed to you or you can pick them up at an Amtrak station. 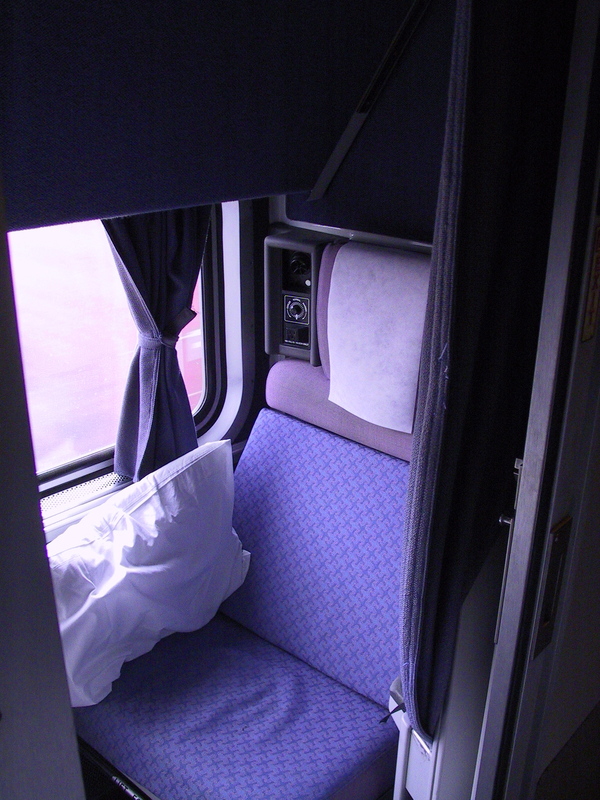 When booking space on a sleeper car, you are immediately assigned to a specific room in a specific car on the train. Amtrak can do this because the train “set” (the number and arrangement of the train cars) for each line is fixed; when the train fills, they don’t add more cars, they simply stop selling tickets. Coach passengers aren’t assigned a specific seat, yet; as they board the train the conductor assigns them to an available seat, and that seat is then theirs for the duration of their journey. Everyone riding the train buys a coach-class ticket. Sleeper passengers then pay an additional fee to upgrade to sleeper class. You can upgrade your ticket when you originally purchase it (as I did), at any time before you board the train (as I did on the Coast Starlight), or even on the train itself. These latter two options are only possible, of course, if there are rooms on the train that are available for the entire duration of your particular journey. Buying the upgrade on the train can be a lot cheaper, but you run the real risk of not being able to get accommodations; you are then stuck in your coach seat for the length of the trip. Although everyone purchases a coach-class ticket, don’t assume that that means that the coach-class ticket price is fixed. Like the airlines, what you pay—for both the coach-class ticket and the room upgrade—depends upon a great many factors. For instance, when you purchased the ticket, how you purchased the ticket (online, on the phone, through a travel agent, etc. ), and what discounts you may qualify for (AAA members get a discount, for instance, as do seniors) all affect the final ticket price. However they figure it, though, the coach-class ticket can be a real deal. For instance, the coach-class portion of my Chicago-to-Emeryville (SF bay area) ticket cost me $109. That seems pretty reasonable, given the distance. The upgrade takes it up to about $500 (but a second person sharing the room would only pay the cost of the coach-class ticket, so two people sharing a roomette on this train would pay about $350 apiece). That can be more than the cost of a plane ticket, of course, but do remember that this covers the cost of your meals and gives you a level of accommodation well beyond what you get in an airplane. Even the coach-class seats are much more spacious and comfortable than your typical airplane seat. Amtrak is careful to assign you to a car depending upon your destination. This is because not all cars on a given train are necessarily going to the same place. The train I rode out of LA, for instance, had two names: The “Sunset Limited,” and the “Texas Eagle.” In San Antonio, those cars designated as Texas Eagle were split off from the Sunset Limited cars. We continued on to Orlando, while the Texas Eagle cars, attached to a new engine and with additional cars added in San Antonio, proceeded through Dallas and on to Chicago. This is nothing you need to concern yourself with, of course. This particular transfer was even scheduled to occur during the early morning hours, so you may find that it occurs as you sleep. Prior to boarding, you will have been given an opportunity to check baggage. 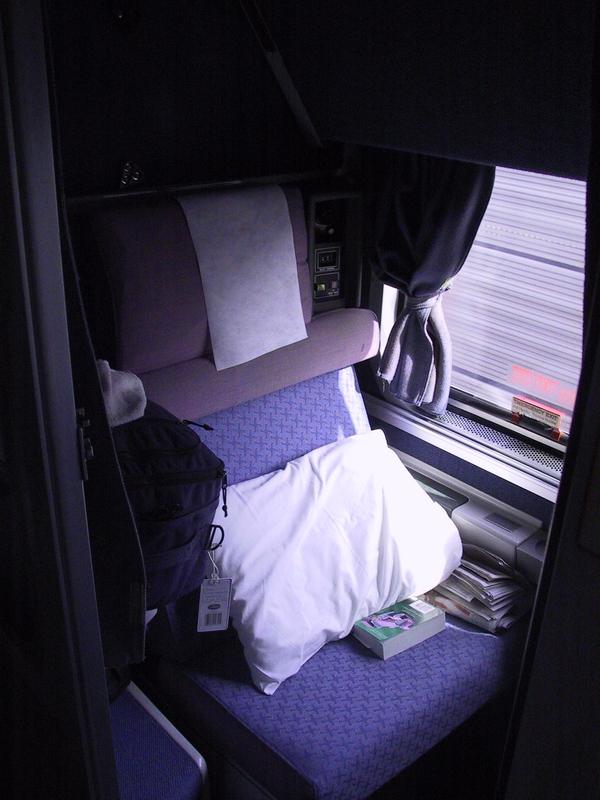 While first-class passengers can check some portion of their baggage, they probably won’t want to: each sleeper car has an area where you can stow baggage, and baggage that rides with you in this manner is easily accessible during your journey, unlike bags that have been checked into the baggage car. Coach class passengers don’t have this same option, so if you are traveling coach you should either pack lightly—and keep all of your luggage with you—or pack carefully so that anything you’ll need during your journey is with you, and not stowed away in the baggage car, inaccessible until you reach your destination. When you board the train, you typically board the car in which you’ll be riding. Your car number is printed on your ticket, and each car is numbered, but you don’t have to worry too much about this: you’ll be directed to the right boarding area. Once you have found your accommodations, spend a little time and settle in. 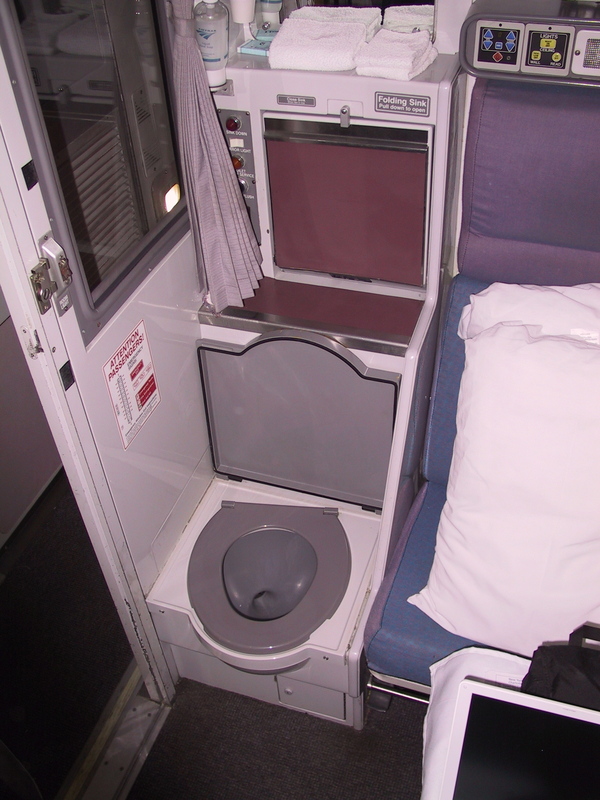 Locate the bathrooms and the shower (on a Viewliner, your toilet and sink are in your roomette, and the shower is down the hall; on a Superliner, there is one bathroom on the upper level, and three bathrooms and a shower on the lower level). The trains appear to be configured with the sleeper cars closest to the engine, followed by the dining car and the parlor car, followed by the coach cars. Thus, when it is time to eat, sleeping-car passengers should head towards the “back” of the train (in the direction opposite of travel). But while you are settling in, your porter will come by and tell you stuff like this, as well as give you the lowdown on the upcoming meal. Dinners are by reservation, so if you board between lunch and dinner, or during the dinner service, you’ll be given an opportunity to make a reservation. Breakfast and lunch are first-come, first-served. Your porter will let you know when the next meal is to be served. Since your first-class ticket includes your meals, you’ll want to take advantage of the dining car service; food served in the parlor-car snack bar isn’t included. Oh—and note that alcohol isn’t included in your “free” meal, so if you want wine with dinner expect to pay for it. Amtrak has a captive audience, and I’m pleased to see that they aren’t gouging their passengers when it comes to charging for food and drink. The meals in the dining car and the food in the snack bar is pretty reasonably priced. As well, you are welcome to bring food and drink on board, so if you are operating on a budget or just don’t care for the food (the quality isn’t great, but it isn’t terrible, either), plan ahead and bring your meals with you. The roomettes are quite efficient: small, but everything you need is there somewhere. Roomettes accommodate two people in a club configuration: seated, you face each other, separated by a small table that can be folded away. Each seat has a reading light and a controllable air jet (like on an airplane). The seats recline, and each of you gets a pillow, so you should be able to make yourself comfortable. Note that one of the chairs faces the direction of travel, while the other faces backwards. Finally, each room has a thermostat that lets you control the overall temperature inside the room. That’s all the space you get. There is room for one other person to stand in the compartment, but there are no folding chairs stashed away anywhere, so if three or more people want to gather, they are well advised to seek out the parlor car. At night, an upper bunk folds down from up above, and the two facing chairs are flattened into a single bed. These beds are comfortable enough, but cannot accommodate more than one person each. If you are taller than about 6’2″ you will likely find that you cannot stretch out completely. I, just shy of 6’1″, had plenty of room. You can request that the beds be put up and down at any time. Don’t have the porter switch the room to “sleeping mode” unless you are really ready to crawl into bed, since the roomette is good for little else once the beds have been deployed. Your porter will wake you up at a specific time, if desired. Breakfast service seems to end early—9:00 or so—so if you like to lounge around in bed, be aware that you may miss your free breakfast. Lunch starts early, however, so that may not be a problem for you. You can shower if and when you like. I never had any competition for it, although other people were clearly making use of it. The shower is tiny, of course; if you have ever used or even seen a shower in a motorhome you have the basic idea. The shower head is on a flexible hose, and that’s a good thing, given that there isn’t a great deal of water pressure; it helps to be able to physically direct the water to various parts of your body. Fortunately, the water is plenty hot. Towels are provided, as are small wrapped soaps. No shampoo, though; bring your own. The shower itself is connected to a small changing room, so you have a dry spot to put your clean clothes on after your shower. You could also shave and put on makeup in here, but out of courtesy to your fellow sleeping car residents you may want to instead perform these activities in one of the regular bathrooms or in your roomette. The roomettes have mirrors and electrical outlets (and the outlets can be used for charging up a laptop, digital camera, or cell phone–I can tell you this from experience!). 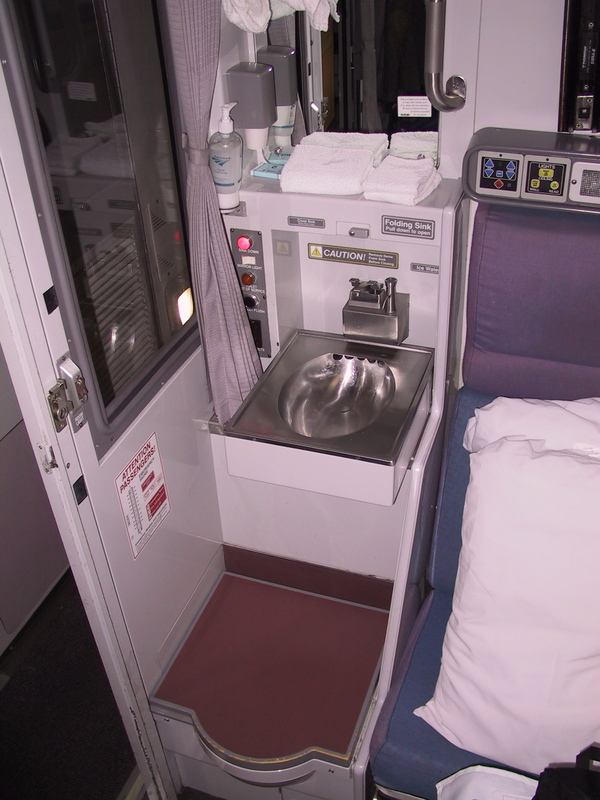 If you are on a Superliner and need a sink, there are three bathrooms right next to the shower, so you can quickly transfer to one of those. One of the nice things about train travel is the fact that whenever you feel somewhat restless, you can get up and walk around. You can walk the length of the train, and, when the train pulls into a station, even get off the train and stand on the platform. On some runs they stop for a good length of time in certain stations. For instance, the Sunset Limited has a scheduled two-hour stop in New Orleans. As long as you have your ticket stub, you are allowed to leave the station, if you like. Just don’t be late getting back! They don’t check to see if you are on board and won’t hold the train for you. Also, be sure to check with the conductor about when the train will actually leave; when we pulled into New Orleans, we were so far behind that they shortened the stop to a half hour. That gave me time to wander around the station, but not to go any farther. Just because you have a room on the train doesn’t mean that you are restricted to it. Coach class passengers aren’t supposed to enter the sleeping cars, but the reverse does not apply. You can wander into the coach cars if you wish, although unless you know someone in there there isn’t much reason to do so; the coach cars are full of seats for the coach passengers. Tables and the like are limited to the lounge and dining cars. Unfortunately, the dining car is only for dining. As odd as it seems, when meals are not being served you cannot use the tables for any other purpose. Try as we might, my fellow passengers and I could not convince the dining car staff to let us sit at the otherwise empty tables and play cards. Perhaps they’ve had problems with people that wouldn’t leave once the meal service was to begin. Whatever the reason, if you want to sit at a table with others outside of a meal you are pretty much limited to the parlor car. On the Coast Starlight, there are two parlor cars: one for the sleeping-car passengers and one for everyone else. And the parlor car we had was very nice: upholstered seats, wood trim, and the like. Unfortunately, this appears to be a one-of-a-kind car; the other trains I have been on so far have no such thing. Only a single parlor car for the whole train, with a limited number of formica tables. The “normal” double-decker parlor car you get on a train such as the Sunset Limited has fixed-position seats, both singles and doubles, facing out the side windows all along the top level. There are no tables anywhere on this level. Curiously, there are video screens at the ends of the car so that passengers can enjoy the nightly movie; however, because the chairs are fixed and facing out of the window, in order to watch the movie you have two either turn your head (for the duration of the film!) or sit sideways in the chair. On the lower level of the parlor car, there is a snack bar that sells a bit of everything: sandwiches, candy bars, drinks both alcoholic and non-, and even decks of cards. Also at this level you’ll find two booths that can accommodate four people each, and two longer couches—one on each side of the car—fronted by cocktail tables. The one parlor car serves the entire train. As you can guess, the two booths are in great demand; they are the only place on the train where four people can comfortably sit and play cards, say. And be aware that there are video screens on this level, too, and the movie plays on them whether you want it to or not. Thus, during the movie this isn’t the most ideal place to sit and have a relaxing chat. On the longer runs, you settle into a routine pretty quickly. Life revolves around meals; other than those, which are regularly scheduled, you find that time moves at a different pace on the train. I started out obsessively checking the schedule each time we pulled into a station, to see whether or not we were on time. After a while—really, after we got so far off schedule as to no longer make a difference—I came to learn that on the train, you just can’t worry all that much about time. The train will get there when it gets there. Don’t plan tight connections, and if possible take a cell phone so that you can alter your plans along the way. And then just sit back, relax, and enjoy the view. You’ll see parts of the country you never would traveling any other way. Large towns, small towns, deserts, prairies, mountains, lakes, oceans: you see it all on the train. And because you aren’t driving, you can take a long, good look at the world passing by outside. Even at night. I found that I enjoy leaving my curtains open at night. Lying next to the window, its really fun watching the lights—and the dark—go by. Unfortunately, Amtrak gets short shrift in Congress these days, and accordingly it is the low man on the totem pole when on the tracks. Freights get priority, so it is almost impossible to keep an Amtrak train on schedule. The Sunset Limited (LA to Florida) is the worst of the lot, I hear. On my trip, we arrived 11 hours late. The Coast Starlight was running about two hours late by the time I got off the train in the Simi Valley. On the other hand, the Silver Meteor, which at one point in my journey was running an hour and a half late, arrived in New York’s Penn station only 15 minutes behind schedule. As I write this I am two hours away from boarding the Lake Shore Limited, which takes me to Chicago. It’ll be interesting to see how on time it is. Traveling by train takes time, to be sure, but it is time you can use productively, and time that you can relax. Unlike airline travel, you don’t have to run the security gauntlet. You can stand anywhere you like on the train, for the entire duration of the trip if you prefer. And you get proper meals, not just peanuts and a Coke. Unlike driving, you don’t have to keep your eyes on the road. And you can stretch, take bathroom breaks, and even eat proper meals while continuing along your way. If you absolutely have to be wherever you are going as soon as possible, fly. If you must have your car at your final destination, drive. Otherwise, consider the train. It works, it is reasonably priced, and one way or another they will get you to where you are going. http://www.amtrak.com is where you’ll find schedules, pricing, and a map of the entire Amtrak system. You can also use the website to track the progress of any Amtrak train, a feature that my family has been regularly taking advantage of. This entry was posted in Uncategorized on May 30, 2014 by Greg Wilson. If you need your car, you can take the AutoTrain. Absolutely true! I’ve always wondered what that is like, but because I don’t live on the east coast it has never made any sense for me. Have you done it?